There was a lot that I liked in “The Hobbit: The Battle of the Five Armies” and there were a few things that left me scratching my head. But first, let’s get the niceties out of the way; this review is chock full of spoilers, so turn back now if you just don’t want to know. Also, this review is based on my opinion, other reviews will be popping up shortly from other staffers, so take that for what it’s worth. Really, if you don’t want to be spoiled, stop reading now! These spoilers reveal a lot, last chance to come back later! Here is a list of all the cool scenes that really made an impact on me. I did rather like that instead of a Flashback beginning, like all the previous films, this one jumped right into the action with Smaug attacking Laketown and everyone trying to flee. On a related note, I love the way Bard faces off against Smaug. He stays so calm and yet watchful and careful as he prepares to defend the city against Smaug’s attack. Once Bain enters the scene, it becomes event better. Everyone who might have been afraid that this sequence would be ruined, or at least lessened by the use of the Wind-lance, fear not, Bard goes real old school in how he launches the fatal shot. The fact that Smaug is taunting him is even more perfect. Dol Guldur – Perfection in just about every way. From Galadriel’s rather relaxed entrance, to Elrond and Saruman double-teaming the Nine, this is the kind of epic showdown we hoped for from the White Council. And then Galadrield goes nuclear on Sauron and things get really serious. If you ever had any doubt that Galadriel was the most powerful Elf in Middle-earth, this will drop you jaw to the floor. It also shows just how close the bond is between Galadriel and Gandalf, so that in 60 year’s time, when Galadrield learns of Gandalf’s fate in Moria, we will be able to feel her grief just that little bit more. Bilbo presenting the Arkenstone to Bard and Thranduil in order to broker peace between them and Thorin. Thranduil is universally dismissive of the Dwarves throughout the film, but Bilbo cuts through the politics and states he would not like to see his friends in battle, so he has come up with another solution. As impressive as it was for Bilbo to make the decision to take the Arkenstone out of Erebor, it is even more impressive that he returns to the Mountain to be with the Company when Bard plays the Arkenstone for peace. 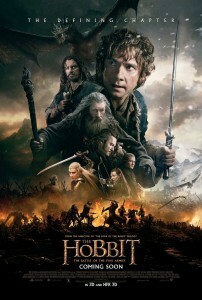 Thorin’s fiery reaction is pitch perfect, and Bilbo barely escapes without being thrown over the walls. Thorin’s decent into madness is expertly played, but my favorite scene is actually when a suspicious Thorin questions Bilbo about what he has in his hands, to discover it is an Acorn. Bilbo picked it up in Beorn’s garden and intends to plant it in his own garden at Bag End. Thorin is so surprised that Bilbo has been able to keep this little thing safe so long, that Bilbo would even make the effort when now he can have a share of the treasure. Bilbo simply reminds that it will grow, and that it will remind him of all his adventures, the good and the bad, all the people he encountered along the way. I believe it is at this moment that Thorin decides Bilbo is the only member of the Company he can truly trust because he just does not covet treasure at all. This whole sequence plays beautifully between these two. 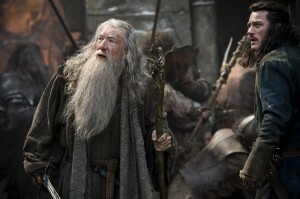 To bookend the relationship between Bilbo and Thorin, at least before the Battle, is the gifting of the Mithril shirt. Bilbo thinks he looks ridiculous, but Thorin knows there will be a fight and that Bilbo needs something to help keep him safe. Of course, it is during this sequence that Thorin confides to Bilbo that he thinks a member of the Company has taken the Arkenstone, that he has been betrayed by one of his own kin. Thorin, Dwalin, Fili and Kili all jump on the Battle Rams brought by Dain’s army and ride those up Ravenhill. It is now made very clear why Dwarves use Battle Rams as steeds, they are the perfect animal for folk who live in or on mountains because they can climb so well. Thorin and Azog, the battle royale on the ice. This is a big, bone crushing battle that is exhausting just to watch, and it ends just the way it is supposed to end. We do get to see how Thorin get’s Orcrist back, which is a nice touch. 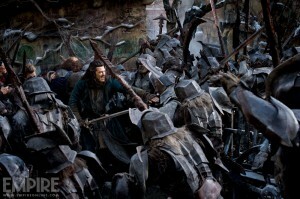 Bilbo does get to join the battle, much more so than he did in the book. He is on the field of battle when both the Orcs and Dain’s Iron Hill Dwarves show up, and then when the Laketown people are withdrawn to Dale, he makes the decision to go warn Thorin that a second Orc army is bearing down on his position on Ravenhill. This, after Thorin nearly threw him from the Walls, is why it is clear that Bilbo is no longer that same Hobbit that left the Shire. Bilbo does get knocked out, but not while he is invisible, and he awakens in time to see Thorin’s epic fight with Azog, allowing him to be there at the end. This will be one of the times you need your tissue. I do so love it when Bilbo invites the surviving Dwarves back to Bag End for tea, whenever they are in the neighborhood. It is so very Hobbity, and emotional at the same time. The auction at Bag End, in the Shire. We finally see Lobelia Sackville-Baggins trying to get away with Bilbo’s spoons, and many other Hobbits do get away with quite a lot of his furniture. Bilbo has to prove he really is himself by showing some document or other with his name on it. Luckily, he still has his contract with his name on it to do so, but alas his home is nearly empty at this point. It is while he is looking at Thror’s Map that we transition to Old Bilbo just at the moment that Gandalf knocks on the day of Bilbo’s Birthday. So the film ends just where it should, back in the Shire where the next story begins. The Last Goodbye by Billy Boyd is a rather perfect song to listen to through the end credits, accompanied by Alan Lee’s wonderful drawings, as usual. And here is a list of the few things that confused me or did not seem to ring true. Not a big criticism, but I found it odd that a few scenes shown in the Trailer released just a month before the Premiere did not make the final cut. There is no Ice Chariot careening down the icy river outside Erebor, in fact there is no Ice Chariot at all. There is also no sequence where you can clearly see the Iron Hill dwarves riding the Battle Rams, which is not a big deal, you see the army, just not the Rams. But since Thorin, Dwalin, Fili and Kili all go grab a Ram to ride up to Ravenhill, it’s an odd transition to not see them arriving. The biggest thing I was looking for was when Bilbo and Gandalf finally discuss the Ring, but it happens in the most unexpected way, and very off hand, as if they almost forgot to include it at all. Just as Bilbo and Gandalf reach the edge of the Shire and Gandalf is about to go his own way, he stops and warns Bilbo that Magic Rings are not toys and should be taken seriously. Basically, it’s the same thing he says to Bilbo after his Birthday party stunt 60 years later. Problem is, the Ring has never been a topic of conversation, so Bilbo is about to deny it when Gandalf stops him and says something along the lines of “I know you found something in the Golbin caves and you’ve been acting strange every since then.” But how does Gandalf surmise it is a Ring of Power and not just some magic Acorn, or a brass button with a charm on it? It’s just a bit out of left field and took me completely out of the scene. The only other bit that made me a bit sad was the fact that Beorn was barely even in the film at all. He arrives at the last minute with the Eagles, lead by Radagast, and he joins the fight by simply sliding off the back of an Eagle and falling into the battle, changing into a Bear on the way down. That is wicked cool, but we basically see just one swipe of his giant paw, sending Orcs flying, and then that is all done. Just not very satisfying at all. Visit our campaign page and find out how you can get involved!